YOGAJYOTI LTD is an incorporation registered in BC, Canada and is fully licensed to teach teacher training courses. 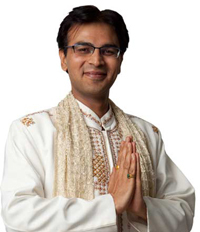 Acharya Aman was born and raised in Punjab, India. In 1995, he earned his lectureship credentials so that he could teach Indian Philosophy at the college level. In 1999, he completed his MBA in Marketing. In 2004, he taught at the Yoga Niketan Ashram in Rishikesh, India for ~1 year. From 2005-2015 he journeyed around the world to teach yoga and meditation. For example, he journeyed to Tokyo, Japan where he learned Japanese and then taught meditation and yoga in several cities. Here, he was also published by a big Japanese publisher. NOTE: Japan is not only recognized for its technology; it’s also known for better health and food. For instance, Japan embraces Zen Mediation (Zen is derived from the Sanskrit word Dhyan – also known as focus and attention). In 2015, he attained his Canadian PR as an author in the self employed / business category (this category is for internationally recognized authors and highly qualified people). During the past decade, he has authored several yoga, meditation, and self-help publications. His credentials were assessed by the British Columbia Institute of Technology, Burnaby, Canada.